All of the rooms at The St Michaels Inn feature superior amenities, including pet friendly accommodations and spacious rooms in a restful environment. Our rooms have been updated for 2018 and offer more of what our guests ask for. With 92 comfortable rooms there are an assortment of different sleeping arrangements, with amenities to meet the needs of our guests. All of our guests have complete access to our outdoor pool. Our beautifully landscaped property will have you and your family spending long, quiet evenings reflecting on your visit to the Eastern Shore. 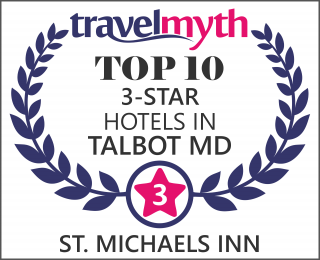 St Michaels Inn is ideally situated to provide you with a more than just a night at a hotel, our goal is to provide all of our travelers a memorable vacation experience. Please notate Pet requests when you make your reservations, pets are welcome for a fee of only $40 in select rooms. Furnished with one queen-size bed, this room is a great choice for couples or solo travelers, featuring free high-speed Wi-Fi and a flat-screen TV with HBO. Treat yourself to a heavenly night's rest in a spacious king-size bed complemented by plush pillows and soft sheets.The mini-fridge keeps snacks cold and fresh. This accommodation is a great choice for friends, colleagues or families traveling together, with two double beds and premium cable TV channels on the flat-screen. Furnished with one queen bed, this ADA-compliant room features wide accessible doorways and grab bars in the bathroom, plus complimentary wireless Internet. Upgrade to the King Executive Bedroom, featuring a plush king-size bed and sitting area with sofa bed. Enjoy complimentary high-speed wireless Internet.